Mitsubishi to sell electric car in U.S.
(autoinsidernews) - Mitsubishi has announced that it is planning to sell a small electric car in the U.S. and Japan in the near future. President Osamu Masuko said the car will be powered by lithium-ion batteries. 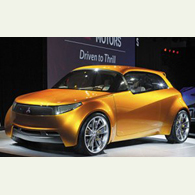 Mitsubishi could also produce a hybrid version of the car, reports Trend. From an environmental standpoint, we believe the electric car is the way to go because it has zero emissions, Masuko said here last week at a Mitsubishi dealer meeting. Fuel cell technology is still off in the future. Diesels are big in Europe but not in Japan and the U.S.
Mitsubishi revealed the Concept-CT MIEV hybrid show car, at the Detroit Auo Show in January. The four-door concept is powered by a 1.1L gas motor and small electric motors on each wheel, which provides all-wheel drive, without a traditional transmission, leading to lower weight.